Patrick Mbazazi: The Man Challenging Museveni from within. . .
A Protestant Mukiga from Kinkizi, John Patrick Amama Mbabazi studied Law at Makerere University. Worked in the Ministry of Commerce during the Idi Amin years. Was an officer in the State Research Bureau intelligence agency. Even as he worked for the Amin government, he and Ruhakana Rugunda started a secret anti-Amin guerrilla group in 1972. After the defeat of the Kikosi Malum and FRONASA guerrilla groups by the Uganda Army in Sept. 1972, Yoweri Museveni decided to give up his armed struggle. At this point, Museveni got information that a man called Amama Mbabazi had formed a secret group. 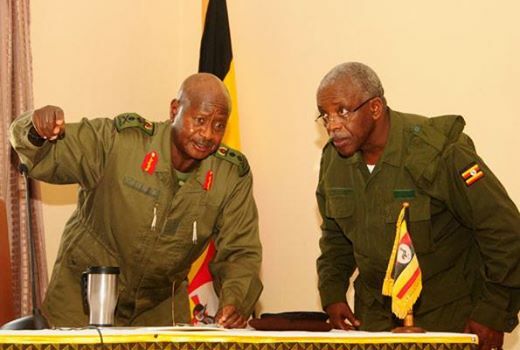 Mbabazi agreed to join hands with the demoralised Museveni and set about re-organising FRONASA into a more effective guerrilla force, setting up cells in many parts of Uganda. His organisational ability was already evident at this time. While Museveni and other FRONASA leaders were in Nairobi, Dar es Salaam and Lusaka, Mbabazi remained behind in Uganda, running almost single-handedly the secret FRONASA activities in Uganda. Mbabazi, meanwhile, is the man who led a delegation of elders and opinion formers from Kigezi in 1976 to propose President Amin as “Life President”. He worked briefly at the Ministry of Defence in the late 1970s. He joined the Uganda Patriotic Movement party in 1980 and after the PRA attack on the Kabamba infantry training school in Feb. 1981, led by Museveni and Lt. Sam Magara, Mbabazi and other NRM leaders lived in exile. While in Nairobi, Mbabazi created an intelligence network for the NRM and at the same time coordinated the settlement of NRM families in exile, finding them homes and schools for their children. He also coordinated the NRM’s contact with foreign governments and is the man who created the structures of what is now known as the NRA/NRM. After the NRM came to power in Jan. 1986, this stealthy man was named the first director-general of the new foreign intelligence agency, ESO. He worked and lived out of sight of the Ugandan public, establishing links with such intelligence agencies as Israel’s Mossad and gained much experience from them. During the 1994-1995 constitution-making process, Mbabazi took charge of the behind-the-scenes formulation of the clauses and sections of the constitution and the 1995 Ugandan constitution can be said to be the partially secretive work of Mbabazi. The 1995 constitution is a Amama Mbabazi constitution, for all intents and purposes. He was part and parcel, if not a lead architect, of many of the domestic and foreign policy maneouvres of the Museveni government in the 1990s, from the secret operations in support of the RPF rebels of Rwanda and other secret regional moves, to managing (or stage-managing) general elections, Uganda’s relations with the West. Ever the clandestine operator, he was also building his own clandestine network of supporters and operatives in every section of the government and civil service, as well as intelligence agencies, in the same way he single-handedly built FRONASA and then the NRM external intelligence in the 1970s and 1980s..
Much of President Museveni’s attention and energy was focused for the 2000s decade on dealing with a new political challenge from Colonel Kiiza Besigye, his main challenger in three general elections. Taking advantage of this, Mbabazi stepped up the expansion of his clandestine network until by 2010, it consisted of a virtual government-within-a-government. When the Vice President Gilbert Bukenya in a May 2005 interview with the then Daily Monitor Managing Director Conrad Nkutu warned of a mafia running the Ugandan government, he mainly had Mbabazi in mind. Bukenya would later retract those claims at a press conference, with Mbabazi standing calmly by his side. Even while he was publicly perceived as aloof and arrogant, Mbabazi continued working quietly behind the scenes to build up support within the NRM party. By the time of the NRM’s Delegates’ Conference at Namboole Stadium in Aug. 2010, Mbabazi was the second most popular leader in the NRM behind only Soroti’s Mike Mukula, and these two were more popular among NRM officials countrywide than even President Museveni. This partly explains what later emerged in the media as Mike Mukula’s presidential ambitions and naturally what fired up Mbabazi’s presidential ambitions even more. Mbabazi won the contest to become the NRM’s Secretary-General and after the 2011 general election was named Uganda’s Prime Minister. He lost no time in taking advantage of both positions and within a year, he was receiving support from both the Chinese government and Western governments in his personal capacity. His national political network, in the meantime, was growing ever more powerful. His wife Jacqueline head of the NRM Women’s League and her sister Hope Mwesigye and the Mbabazi’s daughter Nina started to lay the groundwork for a fully-fledged campaign for Mbabazi as the next president of Uganda, despite public denials and evasiveness by the Prime Minister. Because Mbabazi is so integrated with FRONASA and the NRM, it became difficult for President Museveni to deal with this new challenge without risking the breakup of the entire NRM and possibly his government. Museveni chose to procrastinate in the face of urgings by his family and close aides to dismiss Mbabazi. The president appeared to be torn between his gratitude to Mbabazi for his many loyal years of crucial organisational work for Museveni, his personal discipline, and pressure from the First Family alarmed at the prospect of a Mbabazi presidency. These developments, simmering in the background for a decade, finally entered the mainstream public news when in Feb. 2014 at a retreat of the NRM party at the National Leadership Institute at Kyankwanzi, a move was made to deal with Mbabazi before he went out of the president’s control. A snap vote was called to test party loyalty and send a signal to Mbabazi, over who should be the sole NRM candidate for the 2016 general election. Over 200 votes were cast for Museveni — including one by Mbabazi, to rapturous applause by the NRM officials present. But it was soon clear that this matter was by no means over and crisis meetings at State House were held in early March, at which Mbabazi was roundly condemned by NRM MPs and cadres. President Museveni intervened, reprimanded the NRM leaders who had been heckling Mbabazi to stop it. He reminded them of the crucial role Mbabazi had played in the formation of the military and political structures on which Museveni rode on his way to power, that is, FRONASA and the NRM. As all this was going on, Mbabazi’s family continued to generate support for Mbabazi’s presidential bid while he continued to steadily deny any interest in the presidency. Songs were composed in Mbabazi’s praise by various Ugandan musicians, T-shirts and banners were printed. Jacqueline Mbabazi flew to Kenya where she was given advice by the wife of Kenyan Vice President William Ruto on how to organise the women’s support across Uganda and support also came from Tanzania, the traditional foreign power base of Museveni. During her trips around the country, some NRM supporters took to referring to Mrs. Mbabazi as â€œFirst Ladyâ€. Mbabazi, whose earlier appearances during Uganda cranes matches at Namboole Stadium had been met by boos and mineral water bottles hurled in his direction by the crowd, now started to receive applause and a standing ovation, an indication of how quickly and how much times had changed. Speaking on Radio Oneâ€™s â€œSpectrumâ€ talk show on Friday Sept. 19, 2014, former intelligence officer Charles Rwomushana said the most alarming development in all this is that Western governments are now fronting Mbabazi for Ugandaâ€™s presidency. According to Rwomushana, opposition leaders like Besigye, Mugisha Muntu and others have been given instructions by the West to accept Mbabazi as one of their own or else lose financial support from the West. But, said Rwomushana, Mbabazi had been advised by the West to maintain a low profile and not overtly declare any presidential ambitions. This might explain Mbabazi’s evasiveness every time the presidential bid is mentioned. Rwomushana hinted that the renegade Gen. David Tinyefuza, in exile in London, might be part of this overall Western plan to have Mbabazi succeed Museveni as Ugandaâ€™s head of state. Seemingly aware of this, State House having read the writing on the wall, such as President Museveniâ€™s recent quoting the Biblical story of Dan. 5:25, an effort appears to have been made to try and counter Western moves to back Mbabazi by generating a new alternative: Brig. Muhoozi Kainerugaba, the Commanding Officer of the Special Forces Command and son to the president. In other words, if the West was now indicating that it no longer supports a further term as president for Museveni, then he might as well be succeeded by his son; certainly, from the Museveni familyâ€™s point of view, by anyone but Mbabazi. This, then, explains recent declarations from out of the blue by youths of their support for a Kainerugaba presidency. Chris Obore, the Daily Monitor Investigations Editor, on Thursday morning off-air during the KFM breakfast show, hinted that something was supposed to come from the Mbabazi camp in December. Whether this was to be an announcement by Mbabazi of his resignation and official bid for the presidency, Obore did not elaborate, but he appeared to be sure of what he was talking about. Then on Friday Sept. 19, 2014 came the sudden announcement by the president that he had dropped Mbabazi as Prime Minister. Mbabazi did not seem surprised or bothered by this announcement and some of his aides spoke openly of the â€œchess masterâ€ at work and how the film was now just beginning. At 8:14p.m on Friday night, the workaholic Mbabazi pulled out of his office in a convoy, the last to leave office as is his tendency. The host of Radio Oneâ€™s â€œSpectrumâ€, Edmond Kizito, noted that the presidentâ€™s letter announcing Mbabaziâ€™s dismissal did not carry a date, which might suggest that it had sat in a file probably for months, waiting for the right moment, but also reflecting just how difficult Museveni was finding it in dealing with Mbabazi. Rwomushana, in the best analysis given by anybody so far on the dismissal of Mbabazi, said on Radio One that with this sacking, an â€œavalancheâ€ has now been set in motion over Uganda. Fortunately, claimed Rwomushana, he personally will survive this avalanche because he is protected by the Catholic rosary as Uganda is plunged into a new period of political turmoil and intrigue of, and at, the highest level. As for those not under the rosarial protection, Rwomushana saw a bleak future ahead.